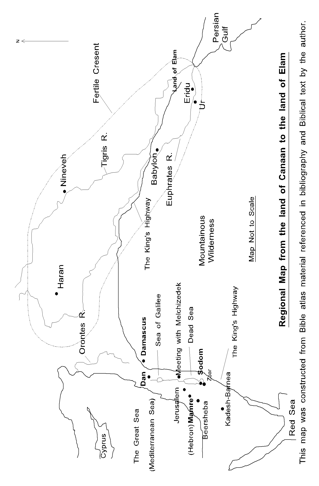 This is a map of the kings highway that traversed from the land of Elam through western side of the land of Canaan to the Red Sea. This is the probable route taken by the kings of the east when suppressing Sodom and Gomorah in the time of Abraham. The map also shows some of the major river systems including the Tigris and Euphrates Rivers and the location of the town of Haran where Abraham had travelled from after leaving his fathers house.